Okay, initially this will just be a "pull" of the other thread so that people can see all the images in question easily. I won't copy every post over, but I will try and incorporate the lessons learned in those discussions. - Why is IDL so slow? - Things are still grainy? How do I fix that? - Map Color? What does it do? - I need help on basic lighting! Help!? 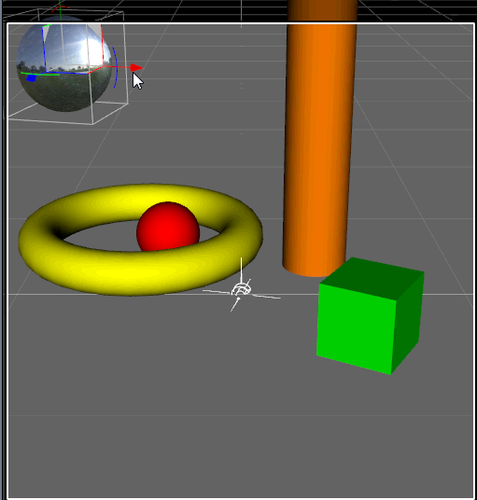 - Environment Sphere appears offset when compared to sphere primitive? - What about all those other parameters you haven't covered? Basically, it occurred to me after reading another thread on IBL (Image Based Lighting) that I, personally, don't really understand UberEnvironment2 (UE2 hereafter) (included in DS3A and DS4A and higher) as well as I should. So this thread, isn't a tutorial. This thread is my journey of collecting what I DO know, what I think I know and trying to learn more. The first thing I know? Well, I've already said it. There's a lot about UE2 that I don't know. I also know that I can get some amazing results out of it but often there is a lot of trial and error and when I find something I like I tend to over use it causing much of the output of many of my renders to have a feeling of "uniformity" even if the content is quite different. So here we are, chronicling my effort to learn more about UE2 and yes, this is pretty much how I learned almost every thing I know about DAZ Studio. Reading here, sharing here and good ol' trial and error. Please feel free to follow along, ask questions, make observations, correct my misunderstandings, etc. as I start this journey of a deeper understanding of UE2 in DAZ Studio. I will primarily be using DS3 for this, but everything still should apply for DS4 users. To start things off, what I've done is I put together a fairly simple scene. Most importantly though I created a ground plane. I wanted to see shadows and we've got to have something for shadows to land on. Then I tweaked the surface of the plane a little bit. I changed the specular color to 255 255 255 and the glossiness to 35%. I also reduced the Ambient strength to 0%. This gives me a slightly better pallet for shadows to land on and should not introduce much in the way of color influence over shadows / bouncing lights etc. I also created a sphere primitive and did basically the same thing, except I also changed the diffuse color on its surface to 255 0 0 (bright red). I did this to give some extra contrast. 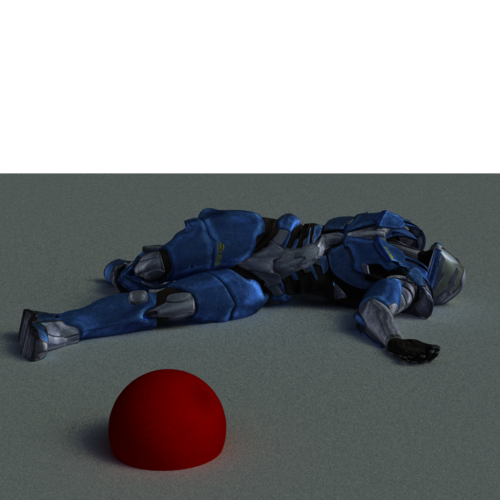 I probably should've used multiple primitives but that was boring so I added the Coalition Claymore suit to the ground so it'd be more entertaining. The next thing I did was add UE2 to the scene, applied the Set HDR KHPark preset and then the 3 high quality preset. Before I went any further, I thought, okay, well, let's see what each of the various Environment Modes on UE2 do. So I'm going to go through them all and talk a little about each as I go. So the first mode I chose was, intentionally the most basic mode UE2 offers. "Ambient (No Ray Tracing)". As one should gather from the name, this mode offers no shadows, no occlusion, nothing but an overall "ambient" light. Rendering the scene in this mode demonstrates that fairly clearly. Now, why might I use this mode? Well, it's durn quick. But really, by itself it isn't all that useful. The way I foresee using this mode would be at a greatly reduced intensity as a supplement to additional lighting. You could easily use it to provide "ambient light" for indoor scene which is notoriously difficult to do using traditional lighting. Perhaps even subtly shifting the light color towards a lighter gray or other color as my suit the needs of that individual scene. It should be noted, however, that even in "Ambient Mode" because I have applied an Environment Map the light has become ambient AND directional. Look at the red sphere in the foreground. It should be fairly easy to see what impact the environment map has had on the way the light is cast over the scene. Were I to rotate the UE2 object, that "hot spot" would also move. 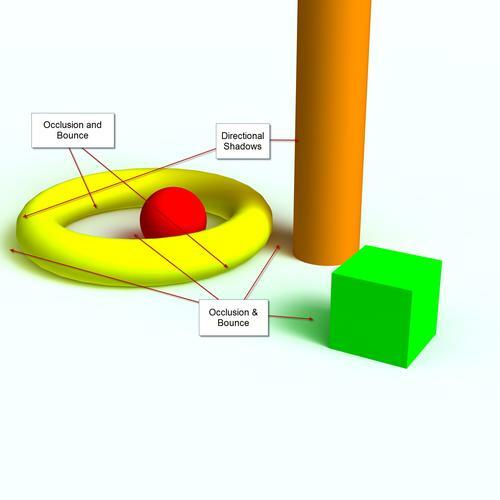 Next, is the first "Occlusion Mode" or "Occlusion with Soft Shadows". What is Occlusion? Well, without getting TOO technical, ambient occlusion determines which areas of geometry are bright and which are dark (occluded). It does this by bouncing light off the object and light that makes it back to the camera makes an object brighter. Light that doesn't makes that part of the object darker. Now, soft shadows... We know that there's another Occlusion mode (Directional Shadows) so what does Soft Shadows mean? Well, effectively it means non-directional. This means that the Environment Map we've specified WILL NOT affect the 'input' of the light when calculating what is occluded. So here's what the same scene looks like with Occlusion w/Soft Shadows set as the Environment Mode. Now, once again, let's look at the red sphere. The "Hot Spot" of illumination is still there. You can clearly see what direction the light "appears" to be coming from... Now look at the plane around each object. You have a fairly uniform shadow (occlusion) around / under everything. It looks pretty good, but given the obvious light direction, it doesn't look very realistic does it? Now, how and why would we use this mode? Well, much like Ambient Environment Mode, I can see this mode being useful with "helper lights". In fact, I tend to use this mode (without an Environment map) in almost all my out door scenes. 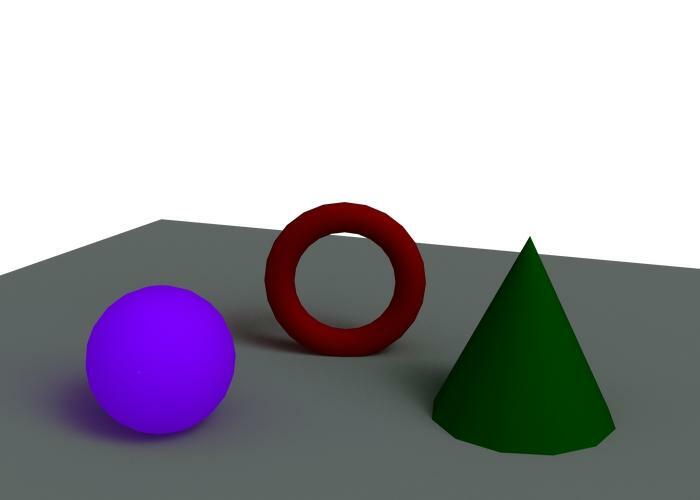 This gives a reasonable approximation of a more global lighting setup, leaves the directional shadows to fixed, traditional lighting and, well, provides occlusion globally instead of per surface but (without a map) you don't have to worry about aligning the Environment map with the traditional light setup. Handy. Although, not terribly accurate as I've mentioned. Occlusion with Directional Shadows. In this Environment Mode, the render engine takes the trouble to create a much more accurate light source (or light source with varying intensity perhaps would be a better way to think of it). 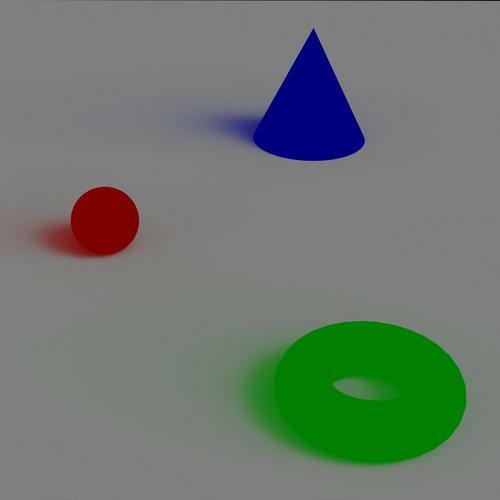 This gives use "directional shadows" and "directional occlusion". Now we can see that the occlusion matches what we would expect with the "hot spot" on the red sphere. Things look more like what we would expect in the "real world." This is the first mode of UE2 that I (personally) feel can be used without much in the way of traditional lighting assistance. However, I still tend to add additional lights to the scene I just take great care to ensure that I line the "sun" of the environment map up with the direction of my primary traditional light source. This is also a good time to bring up the major shortcoming of UE2 in DS3. UE2 in Ambient Occlusion mode does not produce, and in fact, reduces every surfaces specular response. This tends to make things look muted, even though the brightness of the scene may be fine. The way to avoid this, in my experience, is to add a distant light at a low to moderate intensity with an Illumination Mode of "Specular Only" and align that light to match the primary direction of the Environment Map you're using with UE2. This effectively "doubles up" on the specular area and can bring back that depth that UE2 tends to mute. Often it takes me a few stabs at finding the right strength, but I tend to start at 30-40% and go up from there. Rarely higher than 75% but it's happened. Next, we'll try the first of the IDL modes. IDL or Indirect Lighting is basically the ultimate step that UE2 can take. It effectively, combines the Occlusion Modes with an "extra series" of light bounces (partially controled by Raytrace Depth on your advanced Render tab, but also controlled by the Maximum Trace Distance on the Parameters tab with UE2 selected). This mode uncovers one of the biggest flaws with the basic Occlusion modes... Do you expect the soft shadows here to have the same issues they have in Occlusion Mode? You should, because they do... however, that's not the issue. Let's look. Now, isn't that interesting? Can you spot the difference between this render and the Occlusion with Soft Shadows mode render? 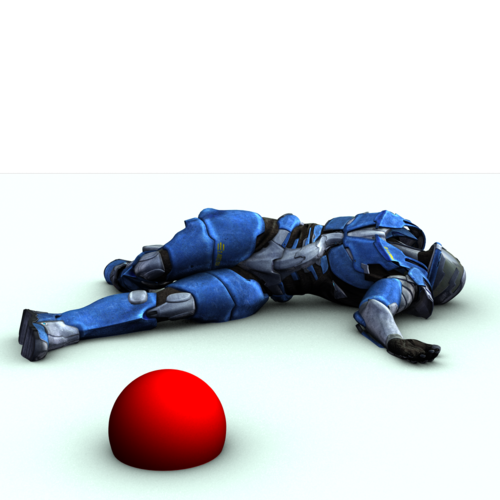 I'll give you a hint, look at the red sphere. 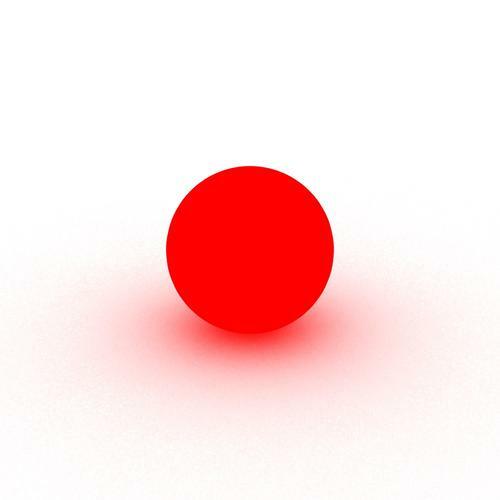 Yup, the "bounce" light has caused the red of the sphere to "reflect" onto the white of the plane. This mode much more closely resembles the way the "real world" works... However, the lack of direction kind of ruins it. Still, I would use this mode pretty much the same way I would use Occlusion w/Soft Shadows. All of that came at a price though. The scene that took 7 and half seconds to render at Ambient Mode and just over a minute in Occlusion modes... took over 22 minutes to render in this mode. Keep in mind that there are no hefty transmaps, reflections or much in the way of "traditional" things that cause "render time increases" in this scene. Yikes. You definitely pay for that extra realism. All in all though, I think this is a mode of UE2 I need to really explore as it seems to create the most realistic results we've seen thus far. But wait, there's still one more mode... "Bounce Light (GI)". Do not confuse this with true Global Illumination. It isn't. This mode is what is ADDED to the Occlusion Modes to generate the IDL Mode. By itself this mode does not appear to be very useful at all. However, it looks like it will work nicely if you supplemented it with traditional lighting. This would give you the benefit of color bouncing without the added penalty of Occlusion. This would work well if you were using Surface based occlusion (i.e., UberSurface, Elite Human Surface Shader or pwSurface). For the sake of completeness, here's the same scene above, no additional changes made, other than the Mode using the Bounce Light mode. Note you can see the color bounce onto the area of the plane around the red sphere, but the shadows are terrible. I believe this is because there's no "real" light source and if there was, the spottiness would go away. Yikes. O_O I'm hoping that's because it had to deal with the situation of not having a primary light to work with. Even the omnifreaker UE2 documentation states specifically that this "method is designed to be used to enhance traditional lighting scenes. When using this mode, spotlights, point lights, etc should be the main source of light." 'll have to experiment with that some more. I think that's a good start to the journey. We've seen what little I know and we've seen what the various Environment Modes do. Alright, as I said at the end of the first lesson we're going to talk about the Map Controls in this lesson. There are only two of different map controls (Saturation and Contrast), but it may or may not be clear what they do. This is the base image. I've added some arrows to each image to help demonstrate what I am observing in each setting. So we can see a pretty clear specular response on each item... the directional shadows, the occlusion near the ground plane as well as the color bounce we'd expect from IDL. Nothing new here. For best results following the rest of this, full view the image above (click on it) and save it out to a folder somewhere. You're going to want to save each image so you can cycle back and forth through them clearly. Name this first image, something like "00a IDL Direct 100 Sat 100 Con.jpg"
The next image, I've reduced the saturation to 50%. What this actually does is reduce the impact of the COLOR on the HDRI Map. Part of what this seems to do is make the specular response larger, but what I believe it actually does, is simply create less shadow. Image : "00b IDL Direct 050 Sat 100 Con.jpg"
And here's Image : "00c IDL Direct 000 Sat 100 Con.jpg" where I've reduced the saturation to 0%. So, given how Saturation works, what about Contrast? How will it work I wonder? This time call it: "01a IDL Direct 100 Sat 100 Con.jpg"
Now, here's "01b IDL Direct 100 Sat 050 Con.jpg" which is at 50% contrast. The first thing to note is, whoa, what happened to the color of the plane? It's definitely more grey. Why? Also, look at what happened to the specular-esque shading on each of the primitives? It got smaller, or at least that's what appears to happen. Now one more for image for though: "01c IDL Direction 100 Sat 000 Con.jpg" which, predictably, is at 0% contrast. So wow, okay, that's pretty strange stuff! Honestly, I'm a bit lost at this point as to what's going on... the plane got darker, all apparent specular response everywhere is gone and we can't even really see the edges of the objects as they're in shadow. How bizarre is that, eh? To see what would happen... I mixed less the above settings. We already know what 100% and 100% look like, as that was the first image we compared against... So what does 50/50 look like? So what does 0% and 0% look like? Well, here it is: "02c IDL Direct 000 Sat 000 Con.jpg"
Personally, I can't really see the difference between that and 100% saturation with 0% contrast. I think that the contrast setting is overwhelming the effect of the "grey scale" nature of the saturation setting and the net results and so close that at least my eyes can't tell the difference. 1) Reducing the Saturation of a map can increase the overall "luminosity" of the map. I don't want to say brightness, because that'd be the intensity control... it makes more areas of the map be treated as light emitting. 2) Reducing the Contrast of the map, keeps "obvious light sources" and "obvious shadows" but pretty much softens the impact of the map as a whole. That's what I've taken away from all that anyway. What can you infer from these results? What did you learn? 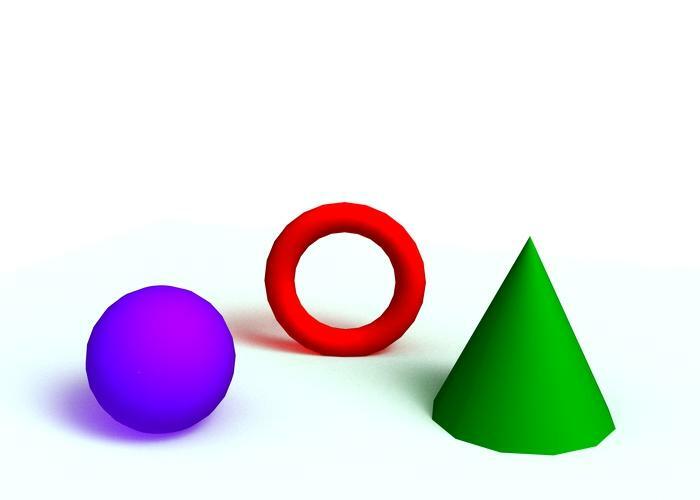 Next we'll go over the "non-quality" portions of the Ray Tracing section. Those being "Occlusion Strength" and "indirect Lighting Strength"... After that will be a brief discussion on the remaining parameters which are all related, in one way or another, to what we would call the "quality" settings. Turning down the intensity of the light along with the contrast really took alot of light bounce out of the scene. First one was normal settings. 100% contrast and intensity on the ue light and no ambient settings for the sphere. I used Hyde Park with 5XHI settings. Second one is with contrast and intensity of the light down to 50% and I added an ambient setting to the sphere of 50% using 255/255/255. It sorta made the sphere glow but turning down the contrast AND intensity of the light, you really lose a lot of bounce. So, we know what occlusion is right? Remember that it is basically a way of determining how much light a surface receives. It's calculated by projecting light (or bouncing it if you prefer) and seeing how much of that light makes it to the current camera. So what do you think Occlusion Strength does? My guess, is that the lower the Occlusion Strength the more closely UE2 will behave to being in Ambient Only mode. In other words, 0% Occlusion SHOULD be the same as Ambient Only mode. That is just a guess. So let's find out, shall we? For this experiment I've created several primitives, gave them colors in the diffuse channel, made sure their ambient channel strength was set to 0%. I also set their specular glossiness to 35%, specular color to pure white, and specular strength to 100%. Then I dramatically upped the quality of the UE2 rendering parameters because I wanted the occlusion and shadows to be ultra clear but we'll cover that later. UE2 is set to IDL w/Directional Shadows Mode using the Park Environment map. I've rotated the Park Environment slightly as shown in the first capture (hint, unhide hidden parameters, unlock the scale, translation sliders on the UE2 Environment Sphere sub-prop and you can Scale / Move it as I've done so you can see where the HDRI map light source will be. Also make sure you rotate the main UE2 object not the Environment Sphere). Okay, so here's the render of the above scene with Occlusion Strength set to 100%. I've attempted to identify what each effect on the scene was going to be. Did you expect the Shadows to the "back left" of each object to disappear? I didn't! I thought THAT was part of directional shadows, but no, that's directional occlusion! We've also clearly lost our bounce colorations as well. You can see it is missing all over the white plane, but also as bounce on the torus by observing how large (or small) the shadow is. So it looks like this might be a good control to use if you find your "color bleed" is too strong, though I doubt one would ever take it to 0% like I have in the example above. So I went on to test what IDL Strength does... My guess is that this time it removes bounce behavior from the light making the IDL Mode equivalent to the Occlusion Mode. Yup, look at that, all the color bleed is gone but we still have the directional occlusion / shadows. So just for kicks, I switched the mode to Directional w/Shadows, re-upped IDL strength to 100% and re-rendered. I can't tell the difference. Why? Because Occlusion mode (as opposed to IDL Mode) doesn't create the "color blending" that the IDL strength parameter is used to control. So basically, IDL Mode with IDL Strength set to 0% is equivalent to Occlusion Mode. I think I've nailed what that one does. Again, I think this time you'd use it over reduced Occlusion to cut down color response but to keep the wonderful directional occlusion that looks so good. That brings us to one that should be fairly obvious, Occlusion Color. Since now we know what each UE2 mode does and how it creates occlusion (soft being "directionless" as opposed to the obvious "directional" modes), we can, reasonably expect, Occlusion Color to tint the "occlusion shadows" based on the color we pick. To be honest, I've never changed this value before. Smile Shadows are supposed to be black right? Well, why might we want to do this? I can think of a few Sci-Fi / Magic effect reasons that might warrant it but what else? How about a fake glow? Cranking up the ambient will get you something that glows but doesn't cast light... Well, if you set the Environment Mode to Soft Shadows and the Occlusion Color to the "color of the light" you're going to get an extra layer of "fake" color added (as opposed to just bounce) that makes it look more like light is being cast. So here's a fiddly bit quicky test I did to see what would happen using the above theory. ;) Ambient is set to 50% strength and the same red (255,0,0) as the diffuse color (and later the Occlusion Color). So, here I've changed the Occlusion Color from 0,0,0 to 255,0,0 and re-rendered. Not the most convincing "light source" but certainly an interesting effect! So another thing you might do with it is change the Occlusion color to generate interesting / unusual shadow colors. Like those "SciFi" effects I mentioned earlier. Here's I've taken the multi-primitive scene and changed the Occlusion Color to 255,0,128. It's most interesting to look at the results on the green cube since the colors there are more additive than the yellow, red or orange. Hopefully this gives you an idea of what you might accomplish. Now lastly let's talk quickly about the various other dials there are on UE2 (we won't cover the hidden ones, just the normal ones). Occlusion Samples - This is a quality knob, but NOT your number one quality knob. It determines how man times to sample colors around the current pixel. Much like Pixel Samples does on the advanced render tab. This helps create smooth color transitions. The "4x high quality" setting of 128 is really quite high enough for almost everything. Shadow Bias - This works like Shadows Bias on any other light. It's the distance, in centimeters to shift the shadows TOWARD the light source to prevent self-shadowing. Shading Rate - THIS is the number one quality knob for UE2. This is functionally equivalent to the shading rate on the Advanced Render tab. In fact, it OVERRIDES the shading rate on the advance render tab at least as far as the Occlusion and Light generated by UE2 goes. The 4X Hi quality setting defaults to a value of 8. This generates the most complaints I see on the forums... "Even at 4x Hi the shadows are splotchy!". This is because, as we discussed earlier in the thread that UE2 is best used as an auxiliary light and not as a stand alone light. For my "high quality" settings a few renders back, I lowered the shading rate to 1.00. You can see how much cleaner things look. Expect the same type of "render time" hit when adjusting the shading rate here. The default value of 8.00 is generally fine when using other lights with shadows. Max Error - This is a quality knob. It's also a very interesting one. I had to do some experimenting and some research to figure out what the heck this is. Basically, this is the 3Delight Irradiance Max Error value. It determines how strictly the irradiance (think strength of emitted light from a surface) is calculated. The short version is, higher values = lower quality = faster renders. When using UE2 with helper lights, it's probably OK to raise this value up from the "4x Hi" value of 0.10. Hope you found all of this useful.